We had to remind ourselves more than once why yet again we were taking a long haul bus ride (12 hours from Marrakech to Merzouga) – packed to the brim with passengers – mostly locals, destined for their family homes in isolated Moroccan desert villages. 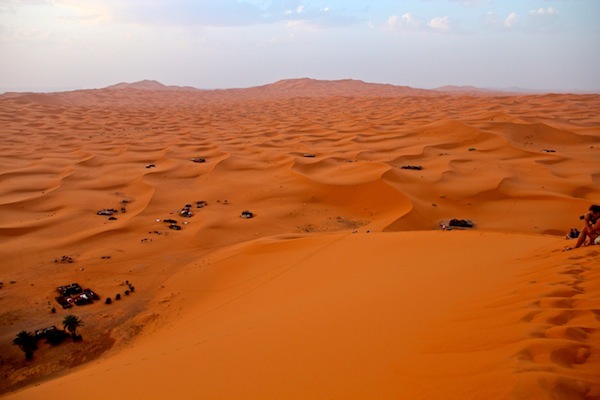 staying with a traditional Moroccan family in a small mud walled house, in the isolated village of Merzouga perched on the edge of the Sahara desert prior to riding out on the back of a Camel, and camping overnight in the great sandy expanse known as the Sahara. Did I mention we happened to visit Morocco during Ramadan, a religious tradition Muslims partake in… which meant among other things that during our visit followers of the Muslim faith would not be consuming ANY food or drink (including water) between the hours of 4.00am and 7.15pm – even in the blistering hot desert where the temperatures often reach 48+ degrees! You can only imagine the disapproving, if not a little envious glares we were receiving as we munched our way through packets of potato chips, sandwiches & chocolate bars during the 12 hour bus ride! After what felt like an eternity, in a cloud of safron coloured dust, the bus finally lurched to a stop in Merzouga… we stepped out onto what was referred to as the ‘bus station’ but in actual fact was more like a small stretch of pothole ridden dirt road, next to a rickety old streetlamp that appeared to have contributed more that its fair share of lighting for the benefit of Merzouga’s citizens over the years. 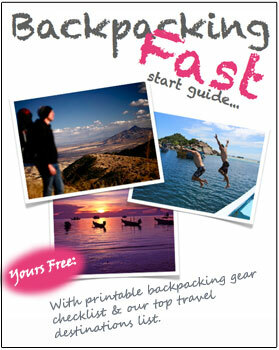 TIP – you must take care when stepping from the bus (even when you have pre booked your accommodation) as you will be immediately swamped with hotel scouts – all promising they have been sent from your ‘pre booked hotel’ when in fact they just want to whisk you off to their own hotel. We had arranged (via Couchsuring) to stay with a traditional Moroccan family in the village of Hassi Labid – a tiny village a few kilometers from Merzouga, on the edge of the Sahara where the camel safari’s depart from for the desert safari’s in the evenings. Breaking off bite sized chunks of bread then dunking them into the tagine before scooping out a mixture of vege’s – just like the locals do it. Nuts and cookies… were washed down with a concoction of juice and fresh milk (not so much my thing) and addictive sweet Moroccan mint tea as we shared our stories & compared cultures well into the early hours of the morning. During Ramadan the people will stay up until midnight to have their ‘lunch’. As we ate, Mohammed’s 85 year old parents and 4 and 5 year old children slept on mats around us – on the open ground under the stars. At the end of the evening we too rolled out thin mattress on the sand outside to sleep – in an effort to get some relief from the unbelievable heat. It was an evening I will remember forever. The next morning we took ourselves on a tour around the rust red coloured, mud walled village of Hassi Labid, but then spent the rest of the day trying in vain to escape the 48 degree heat in a village that seemed ‘airconditionerless’. Mohammed used his local contacts to arranged for our camel trek… the cost was 20 Euros each – left at 5.30pm, and returned the next morning after sunrise and breakfast. (you could do multiple days in the desert if you wanted but we were happy just to have the express experience given the crazy heat). At 5.30pm we were met by Said (pronounced Say-ed) – our camel guide and his two trusty steeds – you know it’s going to be a great trek when your camels are named Bob Marley and Jimmy Hendrix. Said provided us with turbans to shield our faces from the sun and keep the sand at bay during the trek 2 hour out to the isolated campsite. The ambiance of the desert as the heat of the day dissipates and the setting sun turns the sand to a deep rustic red was one of the best travel moments I’ve experienced. It was so serene that nobody spoke for sometime. 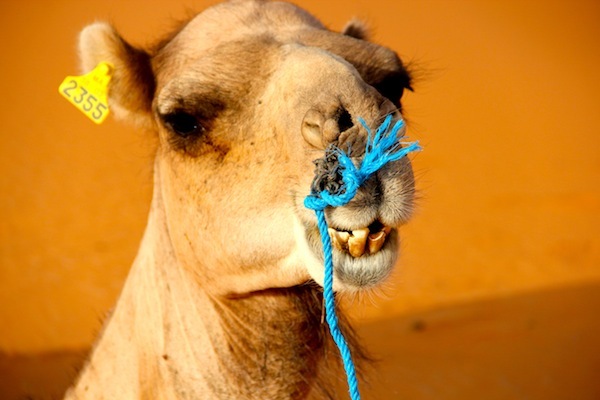 The ride would take nearly 2 hours – camels move much slower than I expected… either that or the poor thing was suffering as a result of my over indulgence in the Moroccan sweets back in Marrakech. We arrived at our camp which we were to share with 2 Spanish travelers and their camel guide. On arrival we sat down to another outdoor Moroccan feast of mint tea, cookies and peanuts while our guide prepared for us yet another delicious tagine. After dinner we were taken on a night tour through the pitch black desert – stumbling over sand dunes (praying a little scorpion didn’t run up our legs) guided only by the light of the moon. Eventually we arrived at a local desert Nomad camp where we were treated to a traditional music show of drums, singing and dancing. That evening we again fell asleep out on the warm desert sand to the twinkling of the brilliant star show above. The next morning we asked to be woken early and made the massive climb up the largest sand dune in order to watch the sun rise – the crazy climb was completely worth it. After yet another delicious breakfast we took the opportunity to snap a few pictures of the brilliant desert, and even collected a small sample of pure red Sahara desert sand – the ziplock bags we carry in our packs came in handy for this. Reluctantly we packed up our gear, jumped back on our trusty steeds Bob and Jimmy – who fortunately stuck around through the night, and headed back to Hassi Labid completing one of the MOST surreal travel experiences we have had the fortune to encounter. 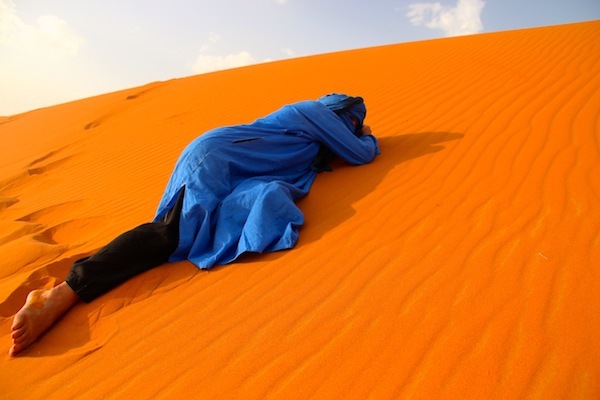 How these people can lay down on desert.. is that not hot. Lovely pictures and post as usual. Overnight Camel Trek with “Cameltrekking Excursions” is an experience you will never forget and one which we hope will bring something unique to your adventure,Our DESERT TOUR offer traditional music and drumming,excellent cuisine and sleeping in the desert beneath a stunning canopy of stars in our tradicional nomadic camp! 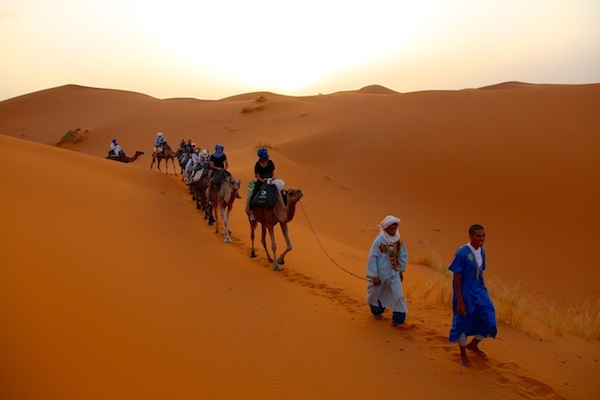 Cameltrekking-Excursions.com Is a small company based in MERZOUGA run by Mohamed, offering private tailored guided cultural tours for singles, couples, families and small groups all around Morocco highlighting the very best of it’s imperial cities, ancient Medinas, Atlas Mountains, Kasbahs and Sahara desert. 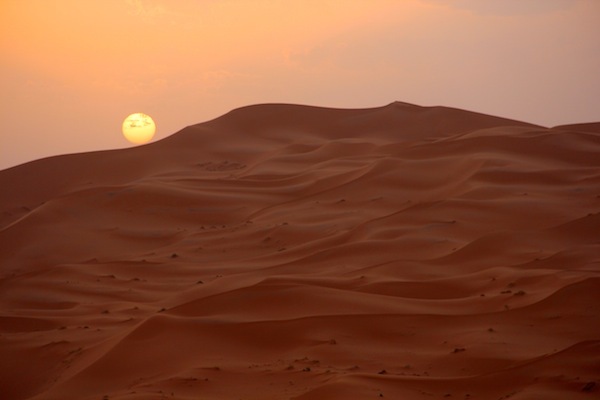 Mohamed found his passion for culture and language amongst the most majestic sand dunes of Morocco called Erg Chebbi, located in Merzouga village. There he led a nomadic childhood with his parents, wandering through the desert with his family and camels possessing only a tent for shelter.